Do you know how to be Pinteresting? We all know what Pinterest is, but what does the term Pinteresting really mean? Basically Pinteresting means that you’re interesting on Pinterest. Before we talk about how to be pinteresting, think about the people and the pinboards you currently follow on Pinterest. Why is it that you follow them? Is it because they are boring? I hope that’s not the case. Why would anyone want to follow a pinboard that’s boring? Instead, if you want to grow your Pinterest following and get more repins, you have to be Pinteresting. If you’re pinteresting, not only will it help you get more repins and followers, but it will also help boost your online influence on Pinterest because people will find the content that you curate interesting and in-turn, share it with their friends. Although most of the users on Pinterest are women, Pinterest continues to see a lot of men join the network. This makes it a great a platform for businesses to boost their online influence and helps them to reach their target audience. By targeting the right audience and getting into their minds, you can influence Pinterest users to not only buy your products, but to also help build your brand, promote your business, and grow the size of your Pinterest following at the same time! Be sure to check out this Pinterest infographic on the different types of Pinterest users, what they do, and where they shop. You may want to connect with like-minded users to help boost your online influence with Pinterest. When you mention the terms, social media and business, a lot of people instantly conjure up images of Facebook, Twitter, LinkedIn, Pinterest and Google+ – along with a long list of questions. What they often forget is that while these are social networks aimed at curating content from around the web, you have to have content to share on them to keep them growing. Enter YouTube, an online video sharing community. In addition to being the number two search engine (behind Google), YouTube is a tremendous social media tool where you can create your own online videos, build an audience, and drive traffic back to your business in a number of ways – by posting a video on your favorite social networks like Facebook or Twitter, encouraging visitors to check out your website, sign-up for your newsletter or as a way to leverage word of mouth marketing where viewers tell their friends about your video. When I first got started making YouTube videos I’ll admit, I was pretty scared. Some of the questions I wondered about were if I could amass any considerable number of views – I also had a lot of questions about YouTube videos – will viewers like my content, will I even get viewers and how do I deal with comments and so on. These are questions that anyone who is just getting started with online video might ask themselves. But just two years later (and 750,000+ views), I’m happy to say that I enjoy making videos – almost more than blogging. And it’s not because I’m shy or anything. I just find they allow me to express my creativity through story-telling along with the creativity that goes into writing each video. So to help you out, I’ve come up with 5 ways you can use YouTube to grow your small, medium, or large business. If you’ve ever taken a photo of your food, read reviews about what others had to say about a new restaurant you’re thinking about trying, claimed an deal from Yelp! or read up on a new shop that opened in your area, then you’re probably a Yelp! user. In fact, Yelp! is a seriously powerful social network. For instance, if you’re using Apple Maps, you’re also using Yelp! as store information, photos and Yelp! reviews are integrated into Apple Maps. 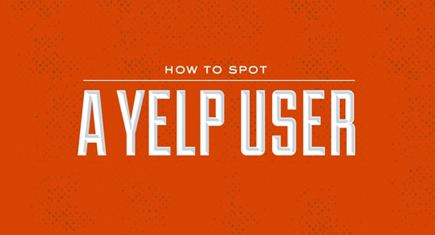 Let’s take a moment to check out 13 ways you can spot a Yelp! user – do any of these describe you? I can identify at least five items. How about you? It’s hard to believe that photography has been around since 1826. Over the past 100+ years, we have seen a number of technological advancements in photography. For example, in 1878, high speed photography made its first appearance. In 1960, film gave way to digital photos taken from the moon. Then in the 80s, Polaroid introduced the instant camera, where you could take a photo and have an instant print-out within seconds. Fast-forward and photography has taken another GIANT leap. This time, courtesy of social media and mobile phones. In the past, cameras used to be expensive and required film. Because of this, only professionals tended to own one. Today, nearly anyone with a smartphone has a solid, quality camera at their disposal because the advancements in photography have helped to shrink the size of the camera, reduce the price, and reduce the need for film, replacing it with a hard drive instead. Additionally, the proliferation of social networks that have popped up in recent years have encouraged users to share more of their daily lives – and because of that, they’re taking more and more photos. Because we’re taking and sharing more and more photos, social media has helped us to expand the size of our networks as well as turn us into budding photographers, allowing us the opportunity to pay homage to cameras from decades past with the help of photo filters. Take a moment to check out an infographic on the history of photography – it’s pretty remarkable how far we’ve come. In just 2 short years, Pinterest has rocketed to the top of many users favorite social networks. Weekly visits to Pinterest jumped 2,183% – a staggering increase, given its short life. So how can you take advantage of this popular social network without spending all of your time doing it? In this article we have compiled 6 useful tools for Pinterest to help you create engaging content, schedule pins, curate pins about your brand, and set Pinterest alerts for your website. Together, you now have a powerful toolbox full of userful Pinterest tools to help you grow your engagement, increase your influence with others and get more repins on Pinterest. Check out these 6 Pinterest tools to help you create more engaging content and get more repins! Over the years, many people have wondered if social media is a fad. Having been heavily involved in social for 6+ years, I would have to say no, social media is not a fad. Sure, other networks will come along and replace what’s hot at the time – just look at how Facebook overtook MySpace. While you cannot stop new networks from popping up, one thing that won’t be disappearing anytime soon is how businesses market and interact with customers and employees.